Last weekend I got to visit one of the smaller but most interesting language conferences in North America: NCOLCTL. Pronounced “nickle-tickle”, it’s the National Council on Less-Commonly Taught Languages. The nomenclature isn’t entirely accurately any more. By any measure, languages like Latin, Italian, Portuguese and Russian are less-commonly taught. But European languages, however large or small, meet at ACTFL, the 5,000+ American Council on the Teaching of Foreign Languages. It makes sense because many teaches of one European (often Romance) language, also teach a second. Chinese and Japanese have moved from NCOLCTL to ACTFL, the Koreans have always met alone, and Arabic has one foot in each conference. Also at NCOLCTL are African languages (mostly Swahili and Yoruba), South Asian (Urdu), Central Asian, and Middle Eastern languages, like Persian, which I was told not to call “Farsi” on account that Farsi is Persian word, not an English one. At NCOLCTL, I shared a table with my friends from Georgetown University Press, whose excellent Pashto book I raffled off a few months ago. I brought back with me a copy of their great Tajiki, which I’m going to write up and give away next week. Back here in Vermont, we’ve been doing some cleaning. Among the many changes shaking the traditional publishing industry is a consolidation in distribution. Last year, we closed our warehouse and starting working with Simon & Schuster for our warehousing and fulfillment. As we cleaned out the warehouse, we found a few nifty pieces of Tuttle memorabilia that I’d like to find new homes for. 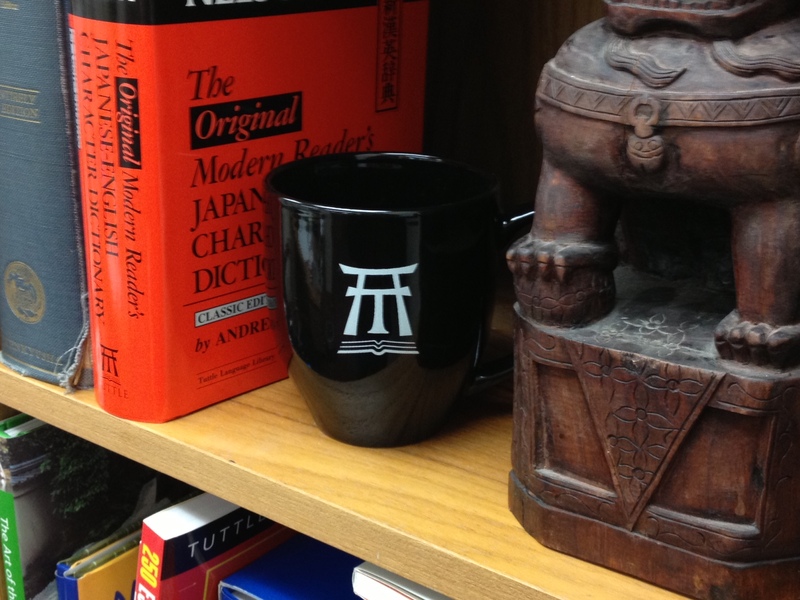 Our coffee mugs feature our traditional torii-gate logo. First, I’ve got a couple of mint-condition Tuttle coffee mugs. The mugs were never something we sold or gave away, but were rather the official office mug here in Vermont for many years. They say “Tuttle Publishing” on the front. On the reverse (see photo) is our traditional logo. The design dates back to the ’50s and is a Tuttle “T” behind the silhouette of a Japanese torii gate. An austere emblem of Japanese landscapes, torii (sort of pronounced like the word “tory”) is thought to come from 鳥居, which means simply “bird perch”. The torii logo stands on top of a open book. In an older version, the “T” was flanked by a “C” and an “E” as we were for many years the Charles E. Tuttle Company. We still sometimes use the old logo on books with wide spines, but have mostly now shifted to the simpler text-only logo at the top of our new website. I have two of these coffee mugs still in their original boxes. If you’d like to enjoy your morning java in a piece of Tuttle history, enter this week’s raffle to win. A vintage, 1950s lapel pin from our Tokyo office. Enter the raffle to win a little piece of Tuttle history. 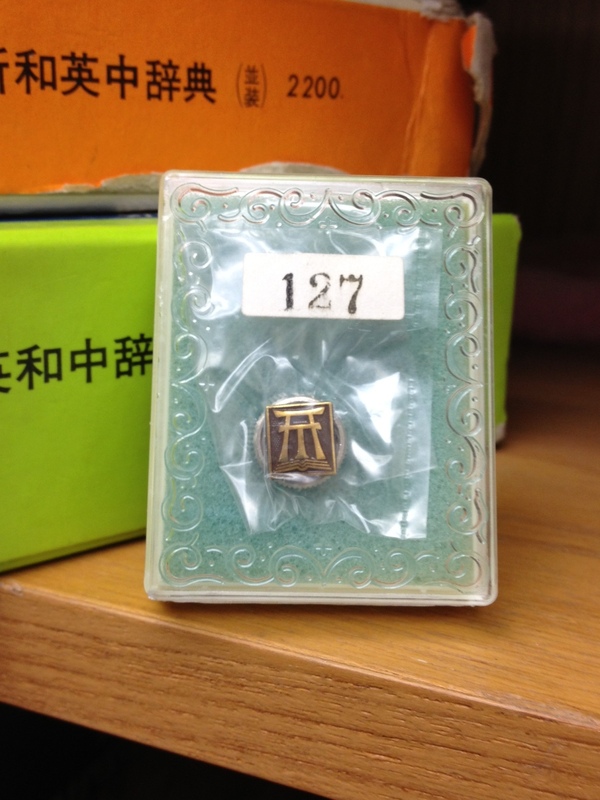 Second is a truly unique piece of Tuttle memorabilia and an artefact of post-War Japanese culture: the company lapel pin. Japan was most open to American culture in the immediate post-War ’50s, when American culture was at its most earnestly conformist. The high aspiration of millions of Japanese men was the rank of サラリーマン (sarariiman or “salary man”), whose badge of honor was an official company lapel pin. A box of Tuttle, uhm, ephemera arrived from Tokyo a few months ago, and inside it we found a lost box of these Tuttle lapel pins featuring the torii logo. They’re still carefully counted, numbered, and boxed. By the time I worked in Tuttle’s Tokyo office in the early ’90s, lapel pins had gone out of fashion, but these are cool souvenirs of Tuttle’s Japanese roots that I’ve shared with some other Tuttle alums. Tuttle’s 1977 New Year’s photo taken on January 5, 1977 in the doorway of our Tokyo office near Iidabashi Station. 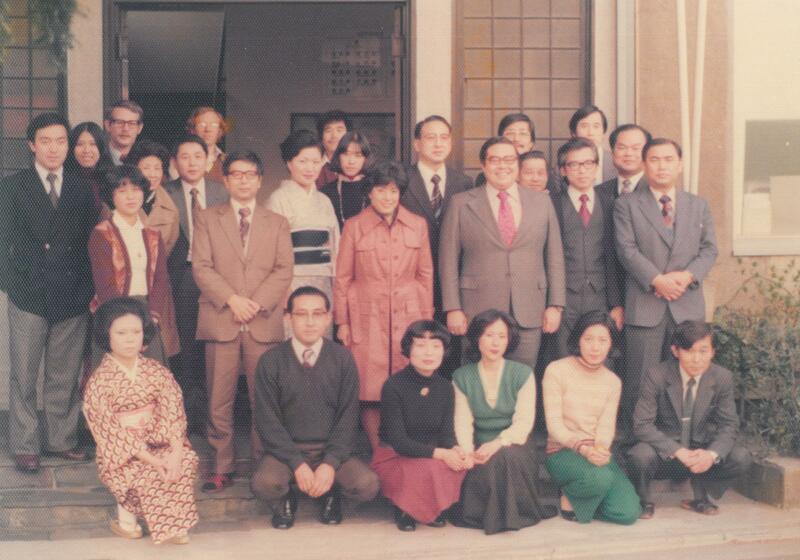 Fifth from the left in the beige coat is Florence Sakade, an editor at Tuttle for more than 40 years and author of “Japanese Children’s Favorite Stories” and “Guide to Reading & Writing Japanese”. I’ve got two of each of these, and if you’d like to win a cup and a vintage Tuttle sarariiman pin, click here to email me and write “Memorabilia” in the subject line. I’ll announce a winner next week. Thanks to Julie up in Orkney, Scotland who won last week’s copy of Adobo Road Cookbook, Marvin Gapultos’s introduction to Filipino cuisine along with a bamboo cooking set. This entry was posted in Free Book Fridays, Japanese and tagged ACTFL, Charles E. Tuttle Publishing Company, Japanese lapel pins, NCOLCTL. Bookmark the permalink.